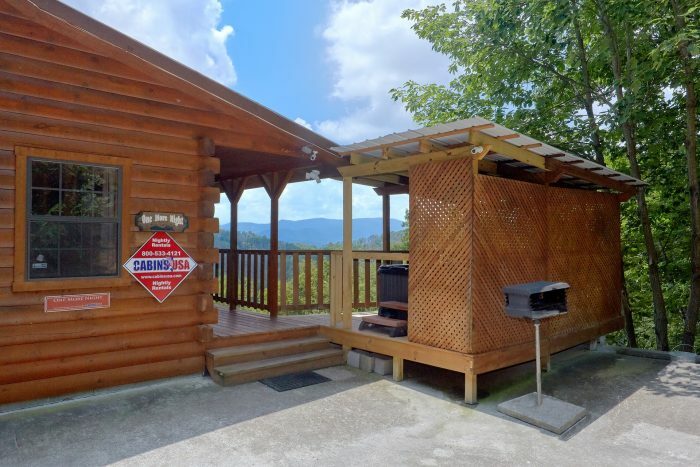 For your vacation in the Smoky Mountains, you can enjoy a cabin with an incredible view and a prime location only minutes from Dollywood Theme Park. 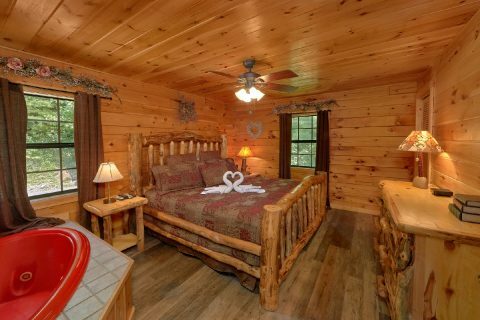 Simply book "One More Night," a two bedroom cabin with everything you need for a relaxing stay with up to 6 guests! 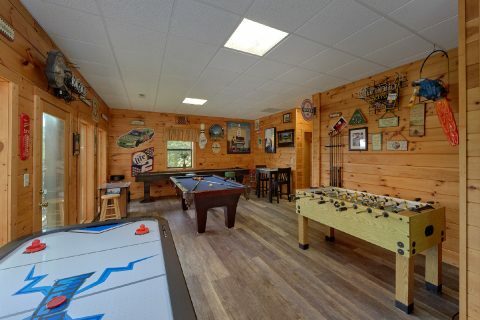 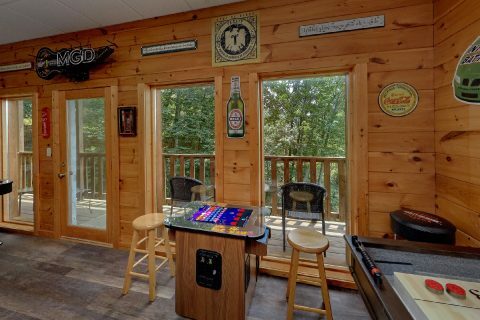 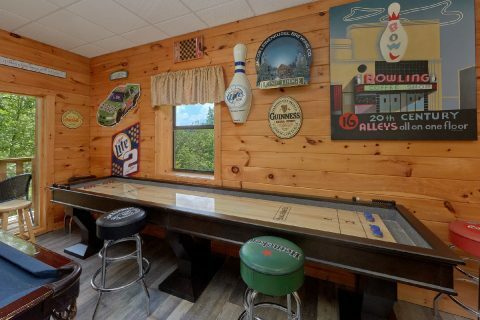 From the marble counter-tops in the kitchen to the incredible game room with billiards, air hockey, foosball, a 12-foot shuffleboard, 48 classic arcade games and more, it's clear to see this luxury cabin is well-equipped for hosting excellent vacations in the Smokies. 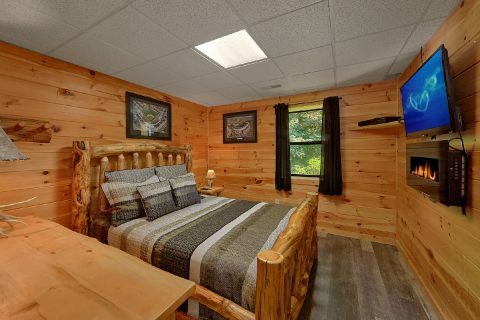 When you awake from a comfortable night's rest in your cabin's two bedrooms, you can enjoy breakfast and a cup of coffee on your cabin's wrap around deck with chairs, a porch swing, and a hot tub. 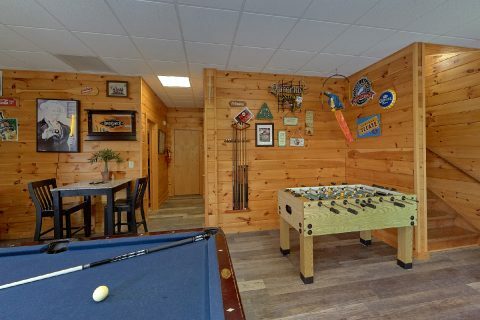 With your cabin's wireless Internet access, you can easily make plans for your next day's adventure in the mountains or share pictures of your stunning mountain view with friends back home. 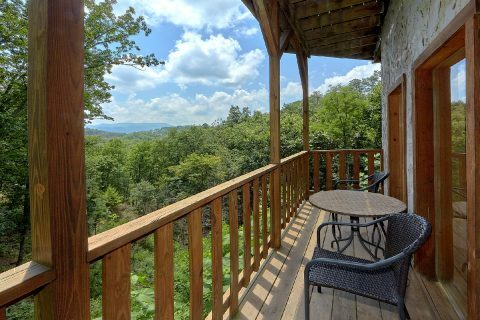 Nearby Pigeon Forge and Gatlinburg are home to dozens of top attractions you won't want to miss. 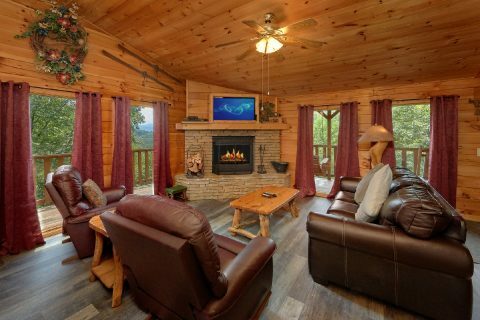 Dollywood Theme Park has great rides, coasters, shows, and a lovely family friendly atmosphere that's famous for Smoky Mountain hospitality. 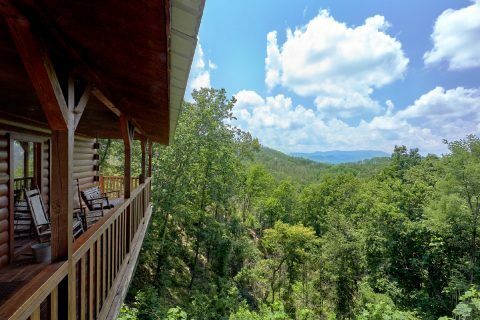 The Great Smoky Mountains National Park is also nearby where you can explore waterfalls and climb mountains. 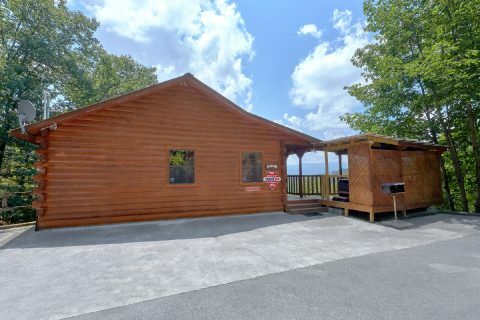 In fact, this cabin close to Dollywood gives guests a view of mountains in the national park so you can admire the same mountain peaks that you enjoyed while hiking. 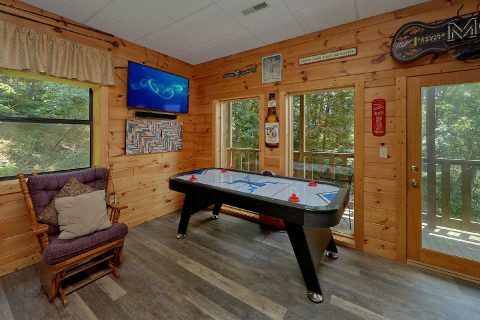 The upstairs living area with a stone fireplace is ideal for relaxing with friends and family while sharing stories of your day's adventure. 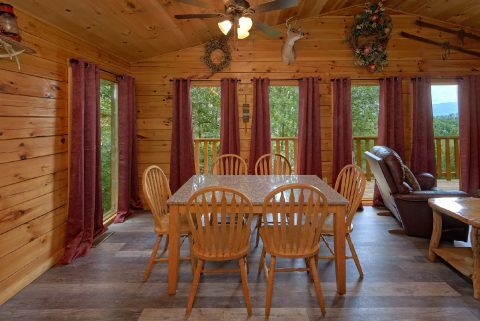 In your cabin's kitchen, it's a cinch to make delicious meals that can be enjoyed in the nearby dining area. 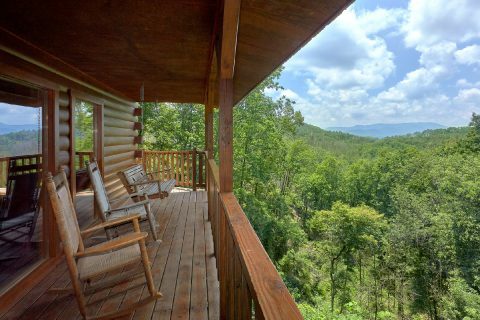 At the end of another excellent day in the Smoky Mountains, watch the sunset from the porch. 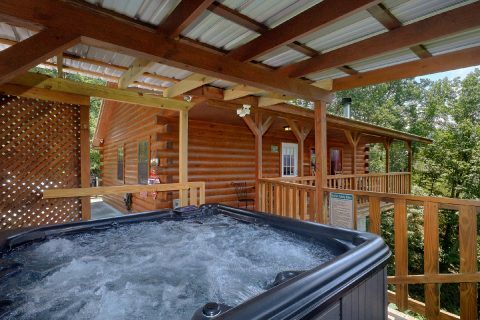 At night, you can see bright stars in the night sky that make this place a truly romantic spot to enjoy a vacation. 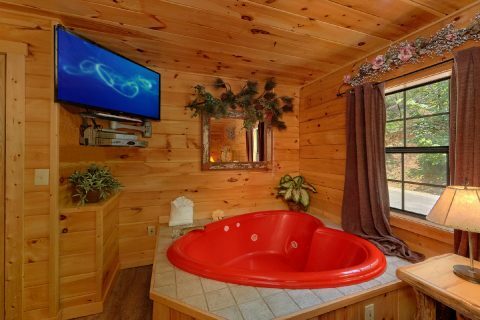 Better yet, you can take a dip in the custom, heart-shaped jacuzzi tub for two! 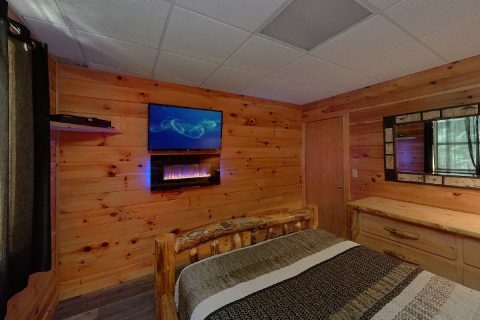 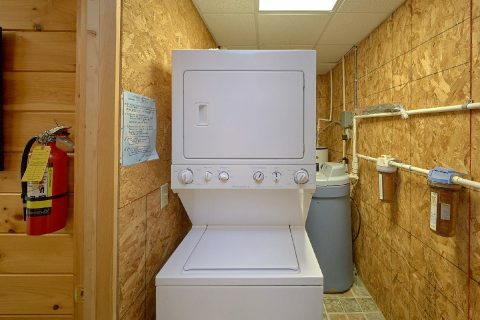 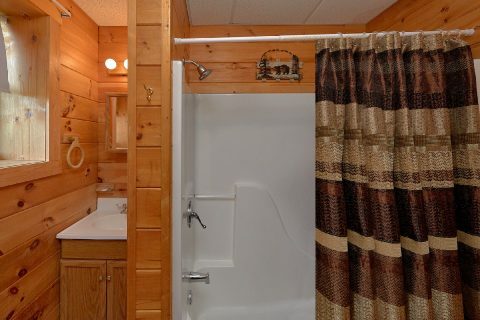 If you plan to visit the Smoky Mountains with a larger group, it is possible to book several cabins in the Upper Middle Creek area near Dollywood to enjoy even more comfortable lodging space. Simply call our office and we can help you arrange several Smoky Mountains cabins for your trip! 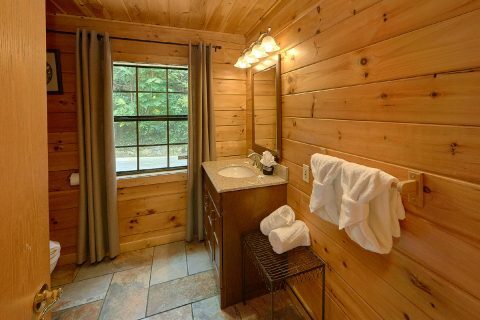 Book this luxury Smoky Mountain cabin online with Cabins USA Gatlinburg and save 15% on your lodging in the Tennessee mountains! 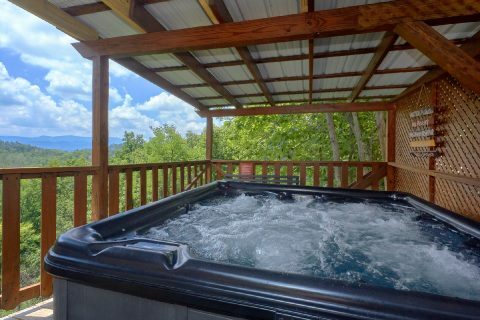 Stay at a cabin with a beautiful view and save big on your vacation in the Smokies!